Capgemini Recruitment 2018: Looking for the Capgemini Employment Opportunities?? then you are at the right site. Every year Capgemini is providing more number of job openings for Entry Level Engineering and IT Internship Jobs. Contenders who want to get the job in the topmost company like “Capgemini” in the world have to check this article thoroughly. Recently the Capgemini organized the Walkin drives in Hyderabad, Mumbai, Bangalore, and Gurgaon for the candidates who are trying hard for the job in the IT Sector. All the aspirants who are meeting with the eligibility can apply for various positions on various platforms. Now, most of the candidates who had completed their graduation and post graduation (an equivalent degree) and the experienced aspirants can apply for the Capgemini Recruitment 2018. Every time the Company officials will recruit the candidates in bulk based on their talent and work experience. 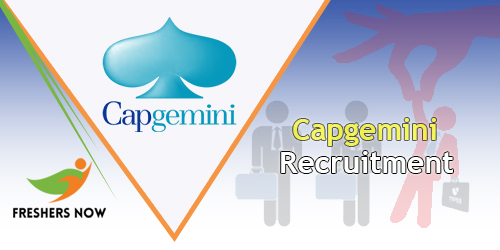 A large number of aspirants are confused how to apply for the jobs in the Capgemini Company. To put an end to all their doubts we have furnished all the details like latest job openings, pay scale structure, eligibility norms etc in this article. Once refer this page until the end and grab the complete details. Capgemini is an Engineering Company which hires the aspirants who are with good technical skills and ready to take some technologies as the greatest challenge. As we all know that the Capgemini deal with the most accurate, complex and useful projects. Aspirants who got selected through the recruitment drive will be trained to lead the complex and multi-disciplinary projects regarding the company. Candidates have to work hard every day with full of trust because it is critically important for the success in any job field. Check the latest Capgemini Recruitment 2018 from this page. Aspirants who are technically sound and interested in work with the reputed company can apply for the jobs by checking the eligibility criteria. For every role, there will be some separate responsibilities, Qualifications of both educational and preferred. So before heading to apply contenders have to check the entire details of the particular role for what they are applying and if they are suitable only aspirants have to submit the application form before the last date. More details about the Capgemini Recruitment are mentioned below. So carefully read this page and commence for applying. Degree of Graduation or Post Graduation, BA/ BS Degree or equivalent are eligible. Should have minimum knowledge in one or more general purpose programming languages. Ability to travel the maximum of time for the purpose of the job. Capacity to think strategically about the complex issues. Online Aptitude Test or Skill Test. It varies from position to position. But for the freshers, it will be 3.2 Lakhs per annum. And for the experienced candidates, it will be 12 Lakhs per annum and above based on their skills. Move to the “Career” page. On the top click on the Jobs tab. Search for the desired role by entering the Search tab in the preferred location. Can apply the filters according to the candidate’s qualification and interest. Hope we have furnished all the details about the Capgemini Recruitment 2018 in an understandable manner. For more details and if any of the aspirant facing while filling the form can immediately Email us or comment us in the below section. We will clear the candidate’s doubts as soon as possible. Visit Freshers Jobs regularly.